For fixing a small smudge or chip in your nails (it's the worst, right? ), use a handy dandy Q-tip. With a Q-tip dipped (not soaked) in acetone, lightly dab the smudge or areas surrounding the chip. Then paint the problem area again and seal the entire nail with top coat. Why use A Base Coat And Top Coat? Are you one of those people who always skips a base coat/ top coat because you have no time to wait that for your fingers to dry? Base coats are formulated to adhere to your nail and allow the polish to be applied smoothly. My current favorite is RevlonQuick Dry Base Coat. Quick drying top coats are the best! Who has time to sit around for their nails to dry? Not me! My favorite top coat is EssieGood to Go , it dries fast, is chip resistant and gives a great shine. Add Essie quick-e drying drops and your nails will be ready in no time! Old, thick nail polish is the worst thing ever. Sometimes when I start applying polish to my nails, I'm super disappointed at the results – bubbles, thick tacky polish. But I just keep going, because I'm too lazy to start using a new polish. This never ends well. But, surprise, there's a solution to this too! No need to throw out the polish. The best thing to do is use nail polish thinner (NEVER nail polish remover! ), Add a few drops in the bottle, shake it up, and it's good as new! Always store polish in a cool, dry, and dark place. UV exposure can break down the pigments over time. Storing them in the fridge or bathroom is not a good idea for a long shelf life. Nail polish should always be stored standing up and on a flat surface. Always tighten the cap when not in use, and clean the opening or cap if polish gets dried and gunked up. Just like how pumping your mascara wand adds air to the product, the same goes for nail polish. Dip the brush instead of dunk. The less air exposure your polish - the better. Depending on the size of your collection, there are so many options for organizing! There are table and spice racks, acrylic wall racks, drawer units from IKEA, floating shelves, plastic bins, and lots of people build their own shelves too. 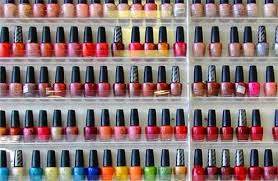 I will say that being organized makes me want to use my nail polish more! I like being able to see my collection instead of digging around or searching for one particular color. If there's a way to save money on anything beauty-related, I want to know. And I'm sure you do too, because nail polish can get expensive at $8, $10, or even more for designer brands. Take advantage of BOGO deals.... Purchase from discounted sites, as well as use promo codes from brands likeZoya for free polish. Everyone has a polish that didn't live up to their expectations, has been neglected, or completely forgotten. A helpful tip is to go through your collection every six months to a year, providing they are not gloopy, tacky or dried up, you can give them away to friends and family or donate to women's shelters, and even sell them online. With these tips we will all be nail polish addicts in no time!